Home - Jim Robbins & Associates, Inc.
Jim Robbins & Associates offers smart solutions for solids handling and pollution control. Need help from an expert? Click here to request a free consultation today. Jim Robbins & Associates exclusively represents manufacturers of bulk solids handling and air pollution control equipment. Our goal is to provide reliable, rugged and cost effective solutions to our customers with equipment and systems that are built to last. At Jim Robbins & Associates, we have one mission: to identify the equipment that offers the biggest advantages in your industrial process—with an exclusive focus on solids handling and air pollution control. We don’t represent every manufacturer that contacts us, nor do we represent just the well-known brands. Instead, we identify and track down the most innovative, specially-engineered equipment for each use case. 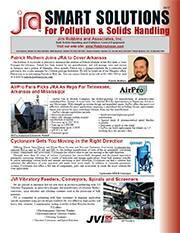 Have a bulk solids handling or air pollution control need? Contact us today and we will be the headhunter for your equipment. Improving your process is our process. We work directly with engineers, maintenance personnel, and plant owners/managers to understand your product, your application, and your process needs. Then we draw on our network of proven equipment manufacturers to identify the most cost-effective solution. Our specialized manufacturers offer a high degree of customization for all products. Their engineering is unsurpassed in the solids handling and pollution control industries. Don’t struggle to find the equipment you need. It’s already waiting for you and we have the past use cases to prove it. Contact us today to schedule a FREE consultation to discuss your needs and the solutions we recommend. Click here to download the January 2018 Smart Solutions Newsletter! Sign-up to receive email updates from Jim Robbins & Associates, Inc. with information about news and upcoming events. Click here to download the most recent edition of our Smart Solutions Newsletter. Will it work for you? Test it yourself. There’s no industry on earth where you’re expected to make a big purchase without trying the product—except for industrial equipment. Jim Robbins & Associates is changing that. We believe your engineering or plant management team should be able to test the equipment, watch it in action, and get up close and personal to see for yourself how it can benefit your operation. Our equipment manufacturers offer state of the art test facilities and in some cases equipment for on-site demonstrations for testing of your products prior to purchase. That way we ensure the equipment will work as described when it arrives for headache-free startup and operation. Want to know if a specific piece of equipment will work for you? Want to see if it lives up to its stated performance specs? Contact us to setup your plant test or on-site demo visit.